Gordian III (Latin: Marcus Antonius Gordianus Pius Augustus; 20 January 225 AD – 11 February 244 AD) was Roman Emperor from 238 AD to 244 AD. At the age of 13, he became the youngest sole legal Roman emperor throughout the existence of the united Roman Empire. 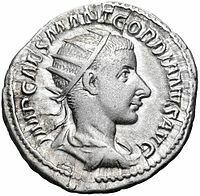 Gordian was the son of Antonia Gordiana and an unnamed Roman Senator who died before 238. Antonia Gordiana was the daughter of Emperor Gordian I and younger sister of Emperor Gordian II. Very little is known of his early life before his acclamation. Gordian had assumed the name of his maternal grandfather in 238 AD. 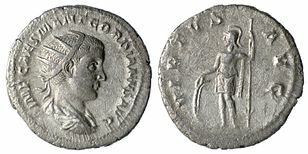 Antoninianus of Gordian III. Inscription: IMP. CAES. M. ANT. GORDIANVS AVG. In 235, following the murder of Emperor Alexander Severus in Moguntiacum (modern Mainz), the capital of the Roman province Germania Superior, Maximinus Thrax was acclaimed Emperor. In the following years, there was a growing opposition against Maximinus in the Roman senate and amongst the majority of the population of Rome. In 238 a rebellion broke out in the Africa Province, where Gordian's grandfather and uncle, Gordian I and II, were proclaimed joint emperors. This revolt was suppressed within a month by Cappellianus, governor of Numidia and a loyal supporter of Maximinus Thrax. The elder Gordians died, but public opinion cherished their memory as peace-loving and literate men, victims of Maximinus' oppression. Meanwhile, Maximinus was on the verge of marching on Rome and the Senate elected Pupienus and Balbinus as joint emperors. These senators were not popular men and the population of Rome was still shocked by the elder Gordians' fate, so the Senate decided to take the teenage Gordian, rename him Marcus Antonius Gordianus like his grandfather, and raise him to the rank of Caesar and imperial heir. Pupienus and Balbinus defeated Maximinus, mainly due to the defection of several legions, particularly the II Parthica, who assassinated Maximinus. However, their joint reign was doomed from the start with popular riots, military discontent and an enormous fire that consumed Rome in June 238. On July 29, Pupienus and Balbinus were killed by the Praetorian Guard and Gordian proclaimed sole emperor. Gaius Julius Priscus and, later on, his own brother Marcus Julius Philippus, also known as Philip the Arab, stepped in at this moment as the new Praetorian Prefects and the campaign proceeded. Around February 244, the Persians fought back fiercely to halt the Roman advance to Ctesiphon. Persian sources claim that a battle occurred (Battle of Misiche) near modern Fallujah (Iraq) and resulted in a major Roman defeat and the death of Gordian III. Roman sources do not mention this battle and suggest that Gordian died far away from Misiche, at Zaitha (Qalat es Salihiyah) in northern Mesopotamia. Modern scholarship does not unanimously accept this course of the events. One view holds that Gordian died at Zaitha, murdered by his frustrated army, while the role of Philip is unknown. Other scholars, such as Kettenhofen, Hartman and Winter have concluded that Gordian died in battle against the Sassanids. Philip transferred the body of the deceased emperor to Rome and arranged for his deification. Gordian's youth and good nature, along with the deaths of his grandfather and uncle and his own tragic fate at the hands of the enemy, earned him the lasting esteem of the Romans. ^ A Global Chronology of Conflict: From the Ancient World to the Modern Middle East, ed. Spencer C. Tucker, (ABC-CLIO, 2010), p.147.